"Sampath Speaking" - the thoughts of an Insurer from Thiruvallikkeni: Fake - currency, fielding, policy .. .. and Justice !!! Fake - currency, fielding, policy .. .. and Justice !!! Are you a fan of novelist (late) Sujatha ? and have you read this novel ?? According to the Advaita philosophy, this world we live in, the space as well as time is a projection of your consciousness or your awareness. In fact one’s mind, one’s thoughts as well as physical attributes are just a projection of that consciousness into the state of waking. Advaita Vedanta calls this projection as Maya. Maya creates apparent multiplicity in a universe where only Brahman really exists. Miles away flourished ‘Maya civilization’ ~ a Mesoamerican civilization noted for its hieroglyphic script—the only known fully developed writing system of the pre-Columbian Americas. 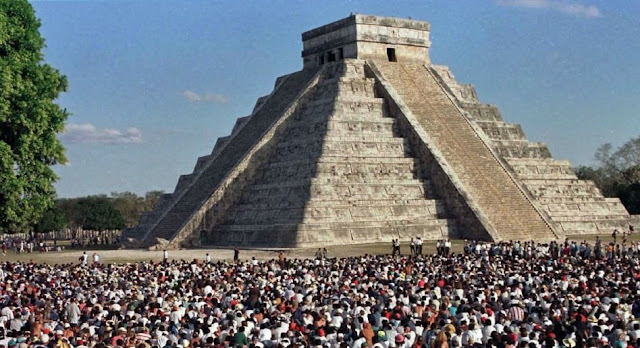 The Maya civilization developed in an area that encompasses southeastern Mexico, all of Guatemala and Belize, and the western portions of Honduras and El Salvador. There are so many fakes in existence !! in the first Test at Koklatta, on Saturday, fourth ball of the 53rd over, Bhuvneshwar Kumar pushed one through covers, cover fielder Dinesh Chandimal, put in a slide even when the ball was nowhere near him, tried to pose a throw in but checked himself. According to the new ICC rules, this is fake fielding. However, on-field umpires – Nigel Llong & Joel Wilson decided against handing a penalty. This left an animated Indian skipper Virat Kohli visibly unimpressed as he gestured towards the cameras for a penalty of five runs. In optics, a real image is an image which is located in the plane of convergence for the light rays that originate from a given object. If a screen is placed in the plane of a real image the image will generally become visible on the screen. A real image occurs where rays converge, whereas a virtual image occurs where rays only appear to converge. In modern World as in old times, pictures do depict a lot ~ the phrase ‘may not depict the true picture’ could mean that the original occurrence could often be much wilder or bigger in impact - Pakistan tried adding a new meaning to the lexicon – by showing ‘fake picture’ in an all important meeting of the United Nations, exhibiting their evil designs. There have been fake currencies and fake Insurance Policies too ~ what interested us most was the ‘Fake IPL Player’ – a blogger, who provided controversial yet interesting posts on IPL team Koklata Knight Riders (KKR) – there were many inside stories often portraying negative side of players, coach and the team owner. The posts were immensely popular and everyone thought the man providing insights of the dressing room was indeed a player frustrated by the treatment meted out. Nothing was going right for KKR that season, two players Akash Chopra and Sanjay Bangar were sent back home mid tournament from South Africa – the team was losing and the owner changed Captain even. All blog posts came with a disclaimer that characrers appearing are fictitious, yet there was uncanny resemblance, almost direct reference to events and bringing out of look-alike facts of the dressing room. It is perhaps time to look for fake judicial officers too, not just fake lawyers. The authorities at the Bar Council of Tamil Nadu and Puducherry are yet to get over the shock of finding that a man managed to serve the Tamil Nadu judicial service as a magistrate for more than 21years without any recognised law degree. Responding to a showcause notice from the Bar Council, the ‘magistrate’, P Natarajan of Ulaganeri in Madurai, said, “It is not fair and justified to cancel enrollment as advocate of a person who was in judicial service for more than 25 years, including 21 years as judicial magistrate.” Natarajan said he did his BGL ‘course’ at Sarada Law College affiliated to Mysore University in Karnataka through correspondence/ distance education mode and was awarded a ‘degree’. Apparently, he attended classes only for the third year during 1975-78. At the time of the convocation, he told the Bar Council, he was not informed that his degree was valid only for ‘academic’ purposes and not for employment. He was then selected as judicial magistrate on February 15, 1982, and after a ‘peaceful’ tenure of nearly 22 years, he retired on June 30, 2003. As if this was not enough, within a month of his retirement, he enrolled himself as a lawyer with the Bar Council of Tamil Nadu and Puducherry and was assigned enrolment number MS1739/2003. After the Supreme Court ordered verification of certificates, the Bar council authorities stumbled upon his case and slapped a showcause notice on Natarajan on January 4, 2016. The notice traced the academic as well as service history of Natarajan and called upon him to explain why he should not be removed from the rolls. While calling it unjustified to remove him at this stage Natarajan replied that the proceedings against him could be dropped, more so because he had sought certain details from Sarada College and the Bar Council of India under RTI Act but both had not replied to him so far. Sources in the Bar council told TOI that its special committee had issued notices to the Madras high court and the Tamil Nadu government, since the man had served in judicial service and was receiving his pension at present. Though the Bar Council of Tamil Nadu and Puducherry has already removed several hundred lawyers who did not meet mandatory requirements to continue practice, the first bench of the Madras high court has stalled the drive for the time being. Tailpiece : ‘Sivantha Kaigal (the red hands or is it ‘tainted hands’ சிவந்த கைகள்) – had an interesting story line. It is the story of a person who finds it difficult to find a job; joins a big Corporate. In a few months time, his boss, who has earned a great name is forced to take voluntary rest arising out of heart-attack, this man gets catapulted to higher echelons – as life curve goes up and up, surfaces the trouble of past – he is no MBA – but had faked a Certificate from an acclaimed University. A sincere old person in HR finds this out – he is taken out to a lonely dam and is pushed down the stream …… the sequel to this story was his ‘Kalaintha Poigal’ (கலைந்த பொய்கள்) – where the daughter of the person would join the same Office and unearth the mysteries…..